recommended for: Fans of Sarah J. Maas (Throne of Glass, Crown of Midnight), Tamora Pierce, Howl's Moving Castle by Diana Wynne Jones, and the Pirates of the Carribbean movies. Readers who love creative high fantasy that's more than elves and war. Readers looking for diversity in setting and characters. Anyone who loves a well-written, adventurous fantasy with a splash of romance. Together, they must travel afar, defeat their foes and break the mother of all curses. With all this going on, falling in love would be such a bad idea... All of this and much, much more await, in the swashbuckling sequel to The Assassin's Curse. If you haven't read The Assassin's Curse yet, you're missing out! If you have, then you know how spectacular this series is. If Throne of Glass is the champion of medieval European young adult fantasy (which I argue, it is), then this series is the champion of the Middle East. Clarke's Arabic-inspired world is richly described and full of whimsical elements: floating islands, spoiled manticores, blood-magic-using assassins, and the formidable Pirate Confederation. I can't love the magic system more; it's element-based but very different from the spell-chucking style of many high fantasies. You have sea witches who commune with the water, wizards who cast unbreakable curses in riddles, and blood bonds. Then there are the characters. I fell in love with Ananna immediately for her fierceness and badassery. She's like a cruder Celaena with a dirty mouth. Naji, the assassin, is gorgeously refined and also overprotective in a non-creepy way. The side characters are way more than props--but we'll get to that. Overall, this book is a worthy sequel to the first. It has all the same adventure and a breakneck plot, but builds on the romance and the raises the stakes. I couldn't put it down to save my life. It's the kind of young adult fantasy that reminds me why I love reading, and leaves me feeling happy and eager for more. I know I just glowed about this book for two paragraphs, but it does have its weak points. I think the plot isn't as tight as The Assassin's Curse. That book followed pretty well from one crisis to another, with a strong central thread that kept you grounded. This one had a few more bizarre sidesteps, so I felt jerked around sometime. I also wondered a bit at how much development there was for one of the central plots. However, suspend a little disbelief and my complaints end. 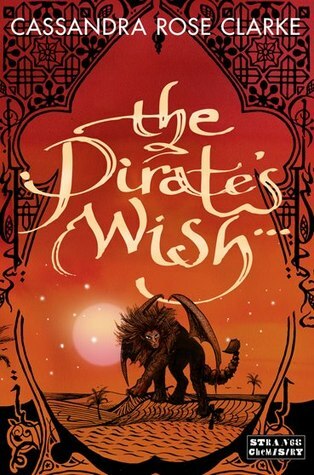 Pirate's Wish was fascinating start to end. Ananna and Naji were ripped between a creepy island, a manticore's kingdom, a vengeful pirate battle, an underwater city--I won't spoil it, but there's a lot going on and Clarke really shows her creativity in every new plot turn. I think I might have said "Wow!" at one point. And it gave me a lot of ideas about places my own book's world could use fleshing. A book that makes me want to write is the best kind! This is high stakes fantasy, but with a bit more whimsy. A little more lighthearted. There's plenty of battles and blood, but you don't get the same dark, beleaguered feeling you get from Throne of Glass or, iconically, Game of Thrones. It's a little more fun. There are talking manticores who obsess over their manes. Bubbly undersea critters with powerful magic. Pirates! It's a little sillier than some of your typical fantasies, and I love it for that. Sometimes, you just want a read that isn't going to make you throw your book at the wall. It also made me laugh, a lot. Ananna is just clumsily funny and you get a lot of her flavor in the narrative. It's a little more classic and fun-loving, a little more Narnia than The Lord of the Rings. Not to mention, it takes fantasy to a Middle Eastern-style world, with a culture heavily drawn from Arabic culture (maybe Saracen-esque?). Uncommon in young adult fantasy, and super refreshing. Way more spices and flowing clothes than steel and fur coats. The characters are a huge strength for me. First off, they're mostly nonwhite, which is tragically rare in a fantasy genre (and a young adult genre!) pretty dominated by pasty faces. (Says the reviewer with the most vampiric of complexions.) AND there's even a healthy lesbian relationship represented! Yay diversity! Also, the characters are just well-written. I fell in love with Ananna on page one. She's fierce, determined, clever, and has a mouth on her. She's also endearingly insecure at times, and stubborn at others. Her choices change the flow of the story; this isn't just something happening to her. Then there's Naji, the sweet and stuffy assassin bound to her. Hate stalker-boys with hot tempers and sketchy "romantic" moves? Look no further! Naji is sweetly overprotective, more like a brother than a batterer, but also acknowledges Annana's own strengths and independence. He's also mysterious, which is pretty hot. Then there's Marjani, the badass pirate woman who takes on their cause and becomes a respected woman in a man's world. The voice of reason and a great role model. Did I mention a hilariously cleanliness-obsessed manticore who thinks humans are servants? How can you not love this already!? Clarke's style in this book isn't as lyrical as some fantasy readers may be used to. That doesn't mean it's bad, by any means. She's just more concise. Pithier. Instead of long, pretty descriptions (which she still has some of), she relies on clever turns of phrase and really innovative ways to look at things. I got a great sense of my surroundings on every page. The lack of flowery writing also helped keep the pace up, especially during the most exciting parts. But there were also plenty of really pretty and clever lines for me to ogle over. Not much to complain about. The arrangement of plot elements could have been less choppy, but the book itself was polished nicely. Not a lot of unnecessary scenes or phrasing. Which I hate.